Available in sizes from 800-52,000 lbs., Allied-Gator’s MT ® Series Multi-Tool uses the patented Power Link & Guide™ System to provide a steady increase in power and control over the tool as it closes, resulting in a 99% power efficiency. 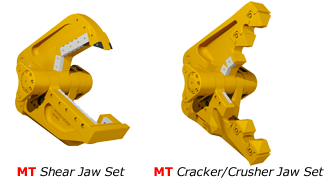 From the fully enclosed hydraulic cylinder to the unique, disposable wear components, the MT Series Multi-Tool is designed to require less maintenance at a lower cost than any other attachment available. The modular design provides maximum versatility and allows Allied-Gator’s patented Quick-Change™ Jaw Sets to be switched by the operator in the field in as little as 15 minutes without ever requiring hub adjustments and/or shaft removal. 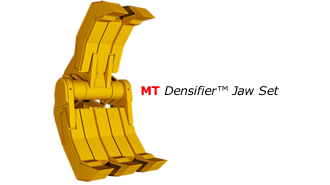 Along with these exclusive benefits, the MT ® Series Multi-Tool features unrestricted 360° rotation, patented Allied-Gator Speed Circuit™ Technology and fixed centerline cycling, which optimizes the tool’s dexterity and production output. This yields faster cycle times, provides pinpoint accuracy and eliminates clumsy material positioning and operator blind spots. In terms of delivering real shearing and crushing power, when and where you need it, the MT Series Multi-Tool is unequaled. 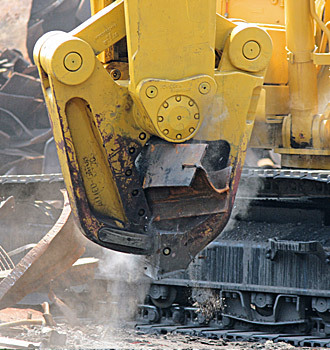 excavator sizes please contact us.